Edmund Charles Tarbell was born 26 April 1862 in West Groton, Massachusetts and raised by his grandparents in the Boston suburb of Dorchester. He showed an early aptitude for drawing, studied briefly at the Massachusetts Normal School (1877-1878), and at the age of fifteen was apprenticed at the Forbes Lithographic Company. 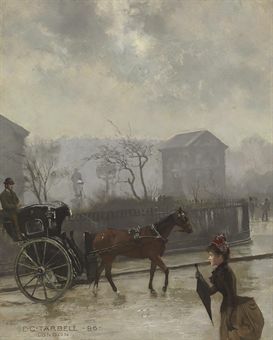 After three years at Forbes, Tarbell entered the Boston Museum School where he befriended fellow students Frank W. Benson (1862-1951) and Robert Reid (1862-1929), and studied under Otto Grundmann (1844-1890) and Frederick Crowninshield (1845-1918). In 1884 Tarbell joined Benson and Reid at the Academie Julian in Paris. Among his teachers were Gustave Boulanger (1824-1888), Jules-Joseph Lefebvre (1836-1911), Adolphe William Bouguereau (1825-1888), and the American expatriate William Turner Dannat (1853-1929). In France Tarbell became aware of the work of the Impressionists and was able to study at length paintings by Old Masters in the collection of the Louvre. Before returning to America, Tarbell and Benson traveled through Italy and England. Once back in the United States, in 1886, Tarbell took a studio in Boston, but also almost immediately went to New York to seek out William Merritt Chase who was at that time president of the Society of American Artists. 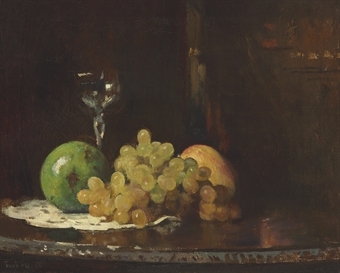 Tarbell subsequently became a member of the Society and exhibited with them, and at the National Academy of Design, regularly. From about 1886 to 1888 he earned an income as a magazine illustrator and portraitist. He married Emeline Arnold Souther in 1888 and soon thereafter began teaching at the Boston Museum School, becoming the head of the painting department there upon the death of Otto Grundmann in 1890. Tarbell taught there for the next twenty-three years. Shortly after a conflict that caused his resignation from the school in 1913, he founded and became president of the Guild of Boston Artists. At this time he was already well-known for his contributions to the Boston art world and for his stature as a member of The Ten, the group of established painters that eventually resigned from the conservative Society of American Artists, holding their own exhibition in 1898. 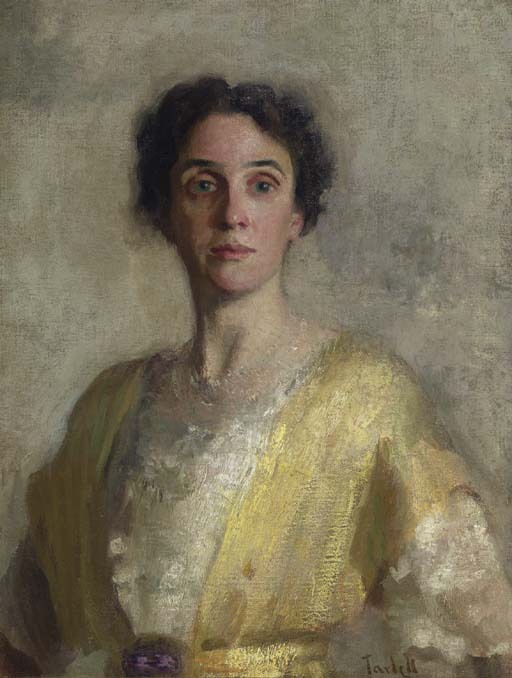 In 1918 Tarbell was chosen for the directorship of the Corcoran School of Art. He spent about seven years in Washington, D.C., but was abroad for a good part of this time, executing portraits. The United States government commissioned likenesses of President Woodrow Wilson and Marshall Ferdinand Foch (both 1920, National Portrait Gallery, Washington, D.C.). By 1926 the artist had retired to his home in New Castle, New Hampshire, where he died in 1938. During his lifetime Tarbell was a tremendously important influence in for Boston artists. His students, and many of his established colleagues as well, were termed "Tarbellites" and adhered to his program of high standards of execution in painting and drawing, and a preference for genteel subject matter. Their style was acceptable to their upperclass patrons who were grudgingly wooed away from a strict belief in the superiority of European artists, to a new appreciation of native talent. 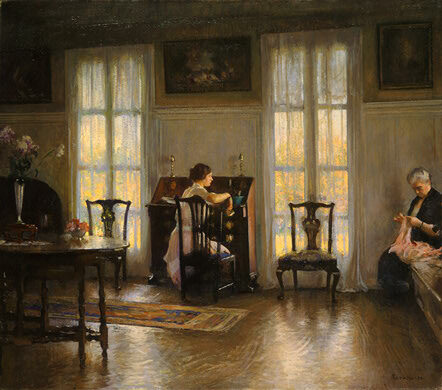 Tarbell's own work was widely exhibited and he was the recipient of numerous awards and medals, including the Thomas B. Clarke prize of the National Academy of Design (1890, 1894, and 1900), Columbian Exposition Medal (1893), and Lippincott Prize, Pennsylvania Academy of the Fine Arts (1895).